CAMPAIGNERS for a cleaner Fishponds are launching a drive to reduce rubbish from takeaways in the area. They hope to work with the operators of some of the fast-food outlets to encourage customers to dispose of their snack wrappings with care. Fishponds Clean Streets members, who have picked up 57 full-size bags of rubbish since they started their regular collections in March, have also started a Twitter account - @cleanfishponds - where they tweet Bristol City Council and outlets whose branded litter is on the streets. 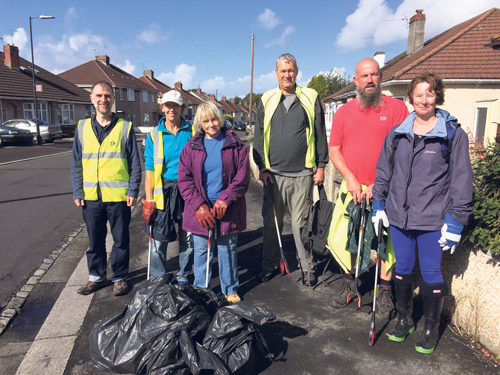 Fishponds Clean Streets has won the backing of the Greater Fishponds Neighbourhood Partnership's environmental sub group, which will urge the council to step up its street cleaning to support the efforts of the volunteers. “They were keen that community efforts should be alongside council services, not instead of them,” said Paul. The group welcomes new volunteers. The collections start in Straits Parade and the next one is due to place on November 20. Check litteraction.org.uk/fishponds-clean-streets for details, as it might be called off if the weather is bad. If you have a suggestion for the volunteers' attention, get in touch via the website.